It’s October, which means…. (drumroll please)…the holiday festivities can officially begin! This month has such great energy and spirit as the leaves begin to change, the cool air starts rolling in and the halloween decorations start making their way out. And if you have a halloween party in your future (and we hope you do!) then these simple tips & tricks on how to spook out your house will definitely come in handy. 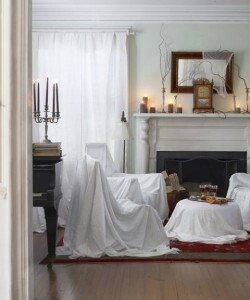 Cover all of your furniture (chairs, sofas, tables, coffee tables, etc) with white sheets for a vacant, “unlived in” feel. It’s the perfect, eerie backdrop for all of your holiday decor, snacks & guests. Then close the drapes and cover the inside of your house with cobwebs and plastic spiders (easy to find at any local craft store, grocery store or convenience store during the fall season). Replace all of your candles with black candles. 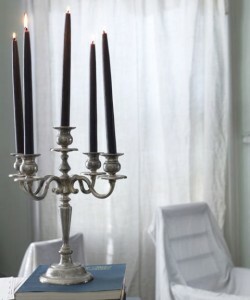 This is especially spooky in a candelabra. Place black flowers in all of your vases. These are easy to find at your local craft store (Michaels, Hobby Lobby, etc) and really set the mood. Lay out black food center pieces. 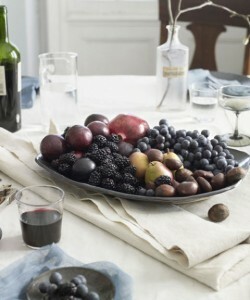 Try to use a dark or silver platter and fill it with black grapes, blackberries, cheese with black wax (there are some great aged cheddars and parmesans that come like this)…get creative! The effect is beautiful, eerie and tasty (we will get to more DIY Halloween food ideas in a later blog post). Place a black wreath on your front door to invite guests in. 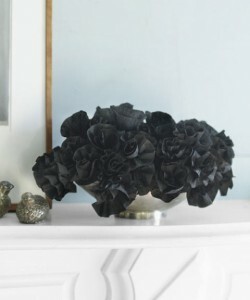 Martha Stewart has a great video tutorial on how to make one yourself using artificial roses, styrofoam and black spray paint (click here). 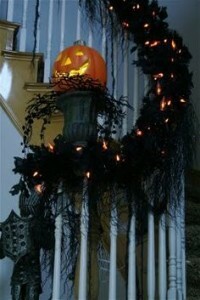 Wrap black garland down your stair way rails and fireplace mantle for a sinister feel. There is a great tutorial on “Little Ant Design Blog” on how to make this yourself using tattered garland and silk (click here). Keep it going and black out as much as possible…table runners, picture frames (use black and white pictures if you are feeling really creative), napkins…the possibilities are endless. Carve some pumpkins (tis the season, after all! ), dim the lights and place candles in them to create your very own jack-o-lanterns. Place these throughout your house at different stations (sitting area, food bar, drink station, etc) to keep the halloween spirit alive! Stay tuned to the Zerorez Oklahoma Blog for additional DIY tips on festive Halloween party snacks, spooky (& simple) costumes, eerie outdoor decor, and more! Ready to Try Zerorez Oklahoma? Give us a call at 405-606-7030 or book your service online by visiting www.zerorezok.com.